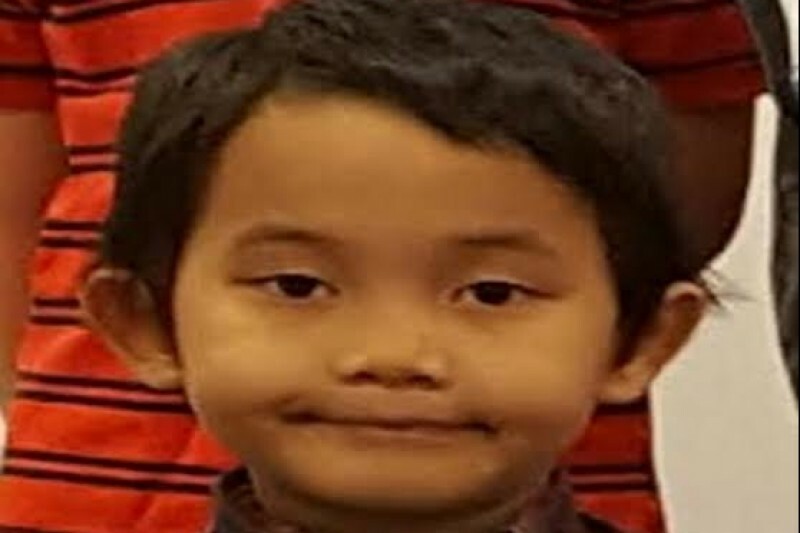 Our thoughts are with the Lincoln School community following yesterday's tragic passing of a Kindergarten student who was struck by a vehicle last week. Thank you to the many Lowell parents who have reached out seeking ways to support John's family and to share your concern about Lowell students who walk and bike to school. Below this letter, please find a link to a Go Fund Me page established to help John's family with medical and funeral expenses. You may click that link to donate if you wish. While we have not explicitly discussed this tragedy with the children at Lowell, some may hear about it from friends and have questions for you. Please reach out to Mrs. Sorensen (celeste.sorensen@cusd200.org), our social worker, if you have concerns, need guidance responding to questions or feel like your child needs additional support. Thank you for keeping the Lincoln School community in your thoughts and for the many ways you support our students and staff daily. Please feel free to reach out to me directly with any questions and concerns. 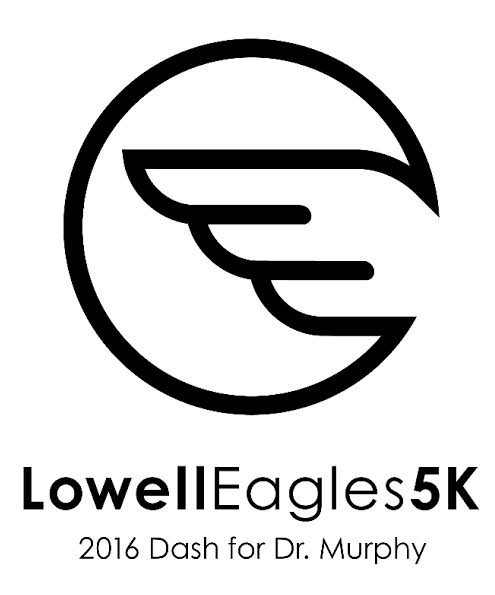 The 19th Annual Lowell 5k was a huge success! 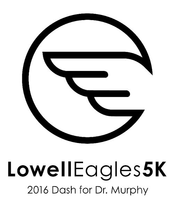 A huge thank you to all of those who participated and volunteered on Saturday at the 5k. We had about 300 runners/walkers and raised at total of $3,285 for the American Cancer Society's Relay For Life. 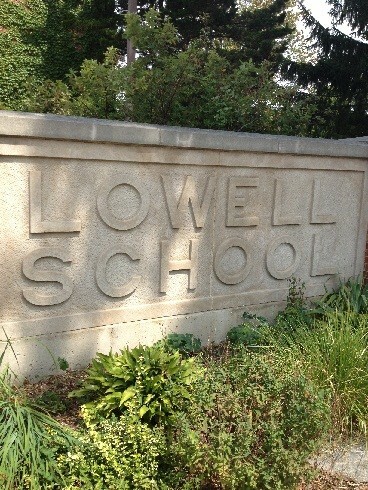 Way to go Lowell Eagles!! 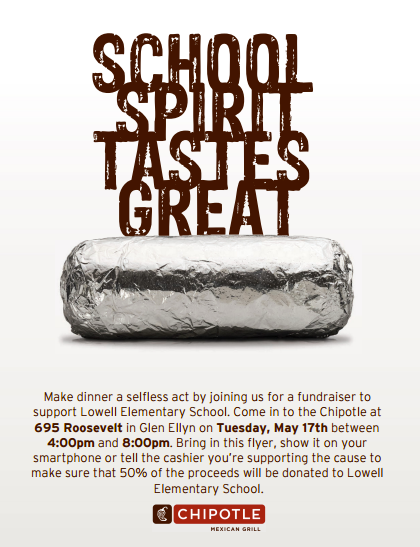 Dine in or carry out to benefit Lowell School! Show the image below when you order! As we shared in March, the state is requiring the new online Illinois Science Assessment (ISA) for students in grade five, grade eight, and high school Biology 1. The federal government mandates that all states administer a science assessment to students once during each grade span (elementary, middle school, and high school). ISA replaces the ISAT (Illinois Standards Achievement Test) and PSAE (Prairie State Achievement Exam) science assessments previously administered in Illinois. Students will take the test online, and it is designed to be completed in less than an hour. Our school will administer ISA to 5th grade students on May 25th. Please reach out to Dr. Melton (kathleen.melton@cusd200.org) with any questions. Crossing President Street at Illinois Street with the Crossing Guard. Crossing all intersections in crosswalks and looking carefully both ways before crossing. Keeping all vehicle traffic for morning drop-off and afternoon pick-up in the fenced off lane on Willow Street. Wearing bicycle helmets when riding bicycles. As a school community, we will continue to monitor the pick-up and drop-off process, share safety reminders with students and parents, and partner with community agencies such as the Wheaton Police Department, World Relief and Northwestern Medicine's ThinkFirst Bicycle Safety program for Grades 1 & 5. We thank you for being extra sets of eyes and ears in the local community, too. The School Supply lists for 2016-17 are posted on the Lowell website (click here)! You may choose to purchase supplies on your own or through Carlson's in downtown Wheaton. Click the link below to access Carlson's online ordering system. Orders may be placed until June 10. You can pick up your order from Carlson's (111 E. Front Street) the week of July 18. Can’t be at Discovery Day but would still like to help in a REALLY BIG WAY???? Please consider donating some of the items listed below. There is a collection box for donations in the school office. Please have all donations in by Friday, May 20th to allow enough time for the leaders to purchase their remaining items. Thank you! Great news, Lowell readers: Battle of the Books will return to Lowell for the 2016 -2017 school year! Battle of the Books is a Wheaton Public Library-sponsored program and is open to all interested readers who will be 4th and 5th graders next school year. Participants read a minimum of 25 books off the library-provided Battle booklist and then meet weekly with teammates and coaches starting in the fall to prepare to compete against other Wheaton elementary schools on their knowledge of their books. Battles against the other schools are held at the library after school during the months of January and February; each school will participate in about 8 battles. Registration forms and the reading list went home with eligible participants this week. As we prepare for the 2016-17 school year, the creation of classroom assignments begins! As a parent, if you have feedback on the type of learning environment that best suits your child, please feel free to send that to kathleen.melton@cusd200.org. Please send any information to Dr. Melton by Friday, May 13. 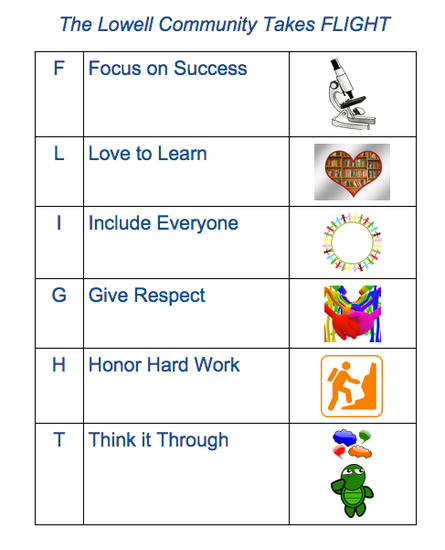 Thank you for respecting the many complex factors that go into setting all students up for a wonderful school year! Our lost and found racks are overflowing! Please have your child look through the lost and found and claim what is rightfully theirs. Periodically, these clothing items are sorted and either donated or discarded. At the end of the day on Monday, May 23rd, the lost and found rack will be cleared. Attention current and future members of the Wheaton Warrenville Special Needs PTA! 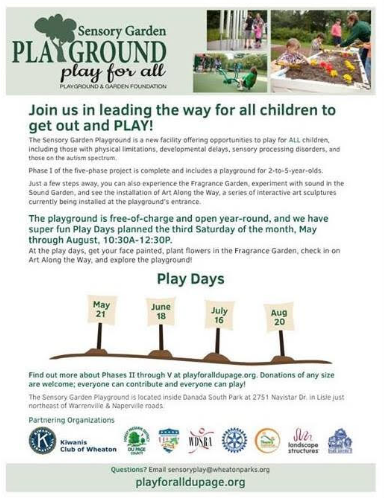 Our last event of this school year will be May 21st from 10:30 to 12:30 at the Sensory Playground! Come out and have some fun! It's a good chance to learn more about us and the other sponsor agencies. Meet other parents in June and July at the summer dates and start of the school year! See you there! 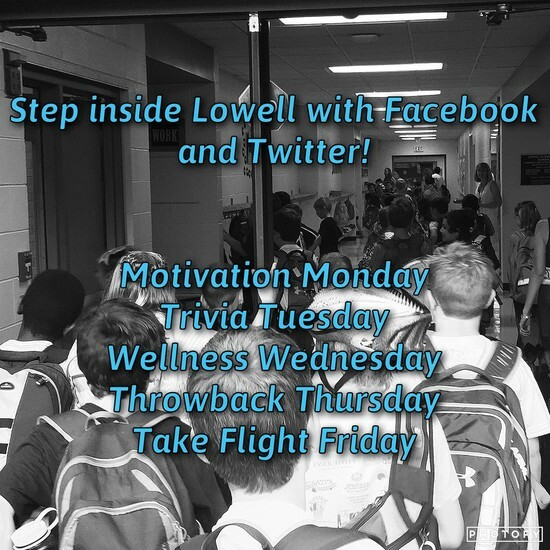 Lowell Eagles Learn: Check out our Stories of Learning! Please view our school blog & consider sharing your own story of learning about Lowell or encouraging your child to write a post! We welcome stories and comments from students, parents, staff, special guests, and community members. 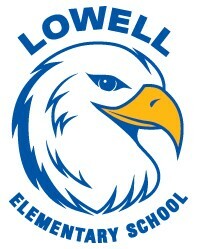 You can find our blog at lowelleagleslearn.blogspot.com or linked below! Please send posts to kathleen.melton@cusd200.org at any time. For every post that is shared, the child's classroom teacher will be entered into a raffle for more classroom supplies! Thank you for helping tell our story! Check out district & community information linked to the District website below.